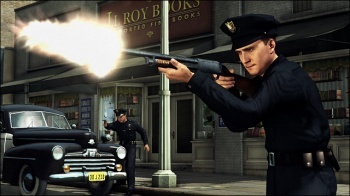 Take-Two's first foray into participating in used sales could come packed with L.A. Noire. Fairly recently, publishers such as EA and THQ have implemented a method of earning funds from the massive used games market generally referred to as "Project $10" or "Online Pass." The initiative inserts single-use codes into new games that allow customers to play online or access other features. These codes are made available at $10 for those that buy the game used. Take-Two said it had plans to do something similar, which may begin with Rockstar Games' L.A. Noire. The latest Xbox Live Newsbeat press email mentions the L.A. Noire "Rockstar Pass" that will launch on May 17 alongside the game. It'll cost 800 Microsoft Points, i.e. the Project $10 price point. Rockstar hasn't spoken up on what the Rockstar Pass is yet, only saying that it'll "take your L.A. Noire experience to the next level. More details are reportedly coming soon. My best guess is that the Rockstar Pass will at least enable access to the host of bonus content Rockstar split six ways for the game's launch depending on where L.A. Noire was pre-ordered. This includes exclusive missions and outfits. Rockstar has said that the content would be available for purchase, yet using the Rockstar Pass for it would seem to negate the whole exclusive pre-order bonus thing. Otherwise, the Rockstar Pass would probably give access to the early rounds of L.A. Noire DLC content, almost certainly already in development. Take-Two might be testing the Project $10/Online Pass waters with L.A. Noire to see how it could work out with another big title rumored to potentially be announced sometime this year called Grand Theft Auto V.
While we wait until May 17 to find out what this Rockstar Pass business is all about, why not watch L.A. Noire's launch trailer here?